Suraj, Rahul, Chandra and around 85 other boys in their ten got a surprised treat from the owner of a brick klin in Nadia’s Krishnanagar, when they received first “Bhai phonta” in their life. The “Bhai Phonta” ceremony, otherwise known as “Bhai Dooj” mark renewal of bonds of sibling love, when sisters apply ‘Phonta’ or ‘tilak’ on the foreheads of their brothers praying their long life. These boys who are the sons of the laborers working the brick klin owned by Ashim Saha of Krishnanagar Ghurni arranged the Bhain Phonta for them. Saha’s granddaughter Delvi, a student of class three, applied the holy ‘Tilak’ to around 90 boys in the klin and sweetened their mouth with Laddu. Delvi’s mother Sylvi, daughter of brick klin owner, who is a teacher at a school in Kulgachi said: “For the last few years my daughter attends the klin to give ‘Phonta’ to her grand father. After the event, she used to play with the children of the laborers of her age. They also like her very much. Yesterday when I was preparing for today’s visit for the phonta to grandfather by her, she asked me why she can’t give phonta similarly to the boys there at the klin. I was moved about her desire and told my father to arrange a small programme at the klin and to take phonta along with the children there. Accordingly my father arranged it and my daughter Delvi applied the holy tilak to all the boys and to her grandfather simultaneously”. Chief minister Mamata Banerjee is all set to be worshipped as the ‘deity of development’, in the form of a new incarnation of Goddess Durga at a puja pandal in Nadia’s Chakdaha. Artisan Subir Pal, who won National award in 1991, has conceptualized the Goddess Durga on Mamata Banerjee and made a life-size fiber glass model of her with ten hands each as mark of manifestation of development that helped her to retain power in the state. 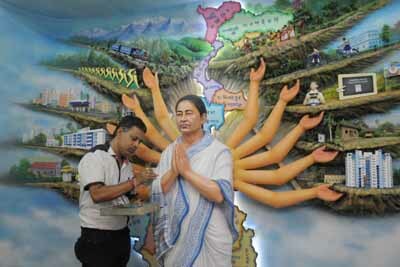 In the puja pandal of Prantik club in Chakdaha, a beaming Bengal chief minister will welcome you in folded hands standing against a map of West Bengal - the land of development, while her other hands will draw your attention to her flagship initiatives like Kanyashree, Yuvashree, Sabuj sathi, Nirmal Bangla, Biswabangla and others that symbolize her development spree. Picture by PRANAB DEBNATH. As per the legend after arrival of Lord Jagannath at Sundarachal in his chariot, he stays there for seven days before returning to Neelachal on the eighth day, which known as ulta rath or the return journey. During his stay at the holy Sundarachal where he remains in seclusion and enjoy pastimes, he is offered special ‘bhog’ with 56 items – called as ‘ChappanBhog’. 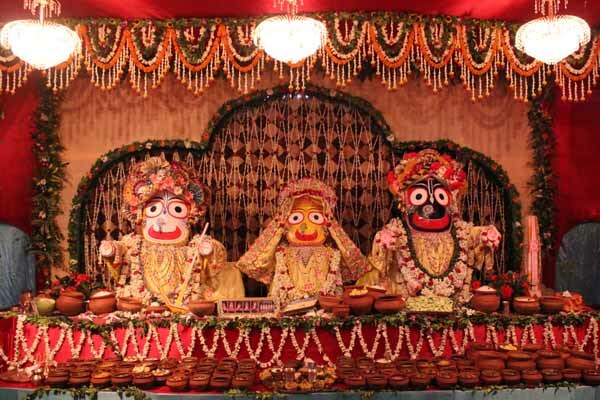 56 items of difference delicacies are daily cooked and offered to the Lord Jagannath until the eighth day – he returns. At ISKCON in Mayapur, the deity is kept for the seven days at the Chandrodaya temple. “Lord was satisfied with 56 items, but at ISKCON we daily make 200 different items bhogs for lunch. The bhog items are later distributed as Prasad at 8.30 pm during these seven days among the devotees”, said a ISKCON spokesperson. On July 13, the deity will return to Rajapur temple, 5km away from ISKCON hub with pomp and splendor. Picture courtesy ISKCON.